It was my mom's turn to host Bunco this month and she created a Luau theme party that got the Bunco Babes in the Hawaiian spirit with leis and grass skirts. Feeding twelve guests can get stressful, so we kept dessert simple. These cupcakes may be from a box but they taste homemade. The trick - use pineapple juice instead of water!! This is soo important and makes a world of difference... turns a yellow cake into a pineapple flavor cake instead. We do the same for our pineapple upside down cake. And to add an extra homemade touch to this store bought mix, a toasted shredded coconut topping with pineapple slices. I don't know about you, but these definitely made me want to hop on a plane to Hawaii! Follow the instructions on the back of the cake box. But instead of using water, use the pineapple juice from the can of sliced pineapple. If it doesn't make a whole cup, fill the rest with water or milk (it won't be much). Pour the batter into each cupcake liner (about 2/3 full). Bake for 12-15 mins in a 325 degree oven. Use a cake tester to check for doneness. While those are baking, toast the shredded coconut in a small pan over medium-low heat until golden brown (5-10 mins). Stir occasionally to avoid burning. Let the cupcakes and coconut cool completely. 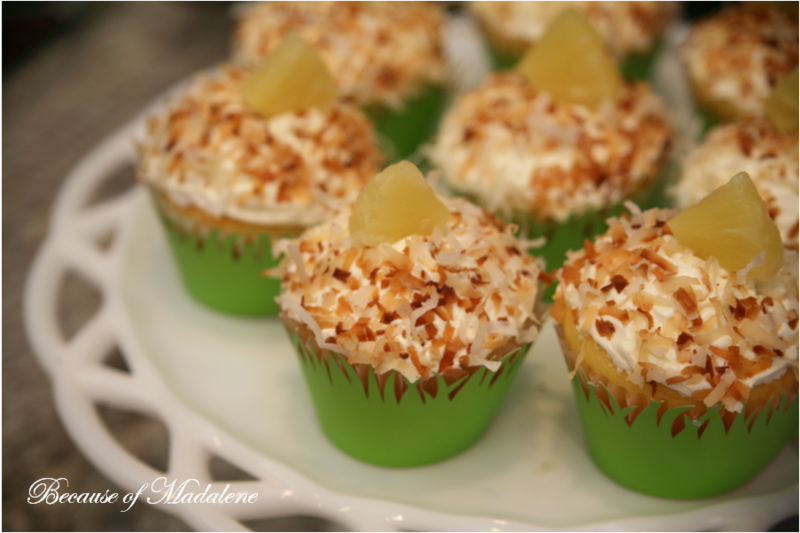 Frost the cupcakes with the cream cheese frosting then dip them into a plate filled with the toasted coconut. Top with a piece of pineapple and serve! Great blog! I'm finding lots of delicious recipes. These look incredible; I have to try them out. So glad I found your blog! I'll be back. Great! Can't wait for a revisit, Courtney.